Over half of the migrant asylum claims heard by Canadian refugee officials this year have been successful. New figures released by the federal Immigration and Refugee Board (IRB) show that of 1,572 claims heard so far, 941 have been granted. The IRB has a backlog of 12,895 cases currently pending. Canada has seen a spike recent months of migrants crossing illegally into the country via the US and making asylum claims. The new figures look at claims received by the IRB from "irregular border crossers" between February and October of this year. Those made by migrants from Syria, Eritrea, Yemen, Sudan, Djibouti and Turkey were the most likely to be accepted. The IRB data confirms that Haitians are by far the biggest group of asylum seekers, filing 6,304 claims with the refugee board over that period. However, of the small number of claims by Haitians processed so far, 298, only about 10% have been accepted. Failed claimants face removal to Haiti. The IRB notes that the new figures represent a small sample - 1,572 of 14,467 total claims - and that "caution should be exercised in drawing conclusions regarding trends". The Canadian Press reported that PM Justin Trudeau said on Thursday that Canada's refugee system is not meant for those merely seeking a better economic future but for those not being protected by their home country. Many Haitians had been living in the US for years but chose to seek asylum in Canada due to fears of deportation. The Trump administration hinted in May it would terminate a programme that gives over 50,000 Haitians in the US protection. It was officially scrapped this week. The programme grants temporary US visas to more than 435,000 people from 10 countries ravaged by natural disasters or war. Canada is planning for another possible wave of migrants as a consequence of the policy change. Canada completely lifted its own protected status for Haitians over a year ago. In terms of numbers, Haitians migrants were followed by Nigerians, who have made 1,911 claims in Canada so far this year. The other top countries in order are Turkey, Syria, Eritrea, Yemen, the US, Sudan, Djibouti, and Pakistan. Canadian officials say US citizens included in the figures are mainly US-born children of migrants. 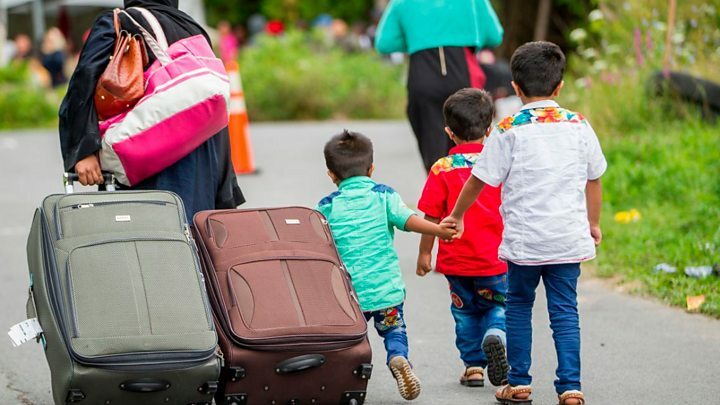 IRB spokesperson Anna Pape said that refugee claims made by Americans are "by and large dependents born in the USA and accompanying parents who are alleging persecution against a different country". In total, 652 Americans have made refugee claims in Canada this year, including 366 who made claims at an official border crossing and those who came through illegally. Between 2013 and 2016, the numbers ranged from 69 to 129.